Posted July 4th, 2014 by Rohene Bouajram and Rowena Mondiwa & filed under Diversity. As immigrants with a strong connection to Southern Africa, our desire was more than just gathering a group of people connected to a region we call ‘home’ – our aspiration was to give voice to a small but growing population in Vancouver. The Baobab Project became a venue to tackle what identity, belonging, and membership to a Southern African diaspora community meant, looked, and felt like. We wanted to address questions such as: How do we define our identity? How has our time in Vancouver changed who we are? Do we belong and how do we create such belonging? Do we feel connected and part of communities in Vancouver? Throughout the lively discussion, participants and facilitators tackled and discussed the questions while co-creating a visual piece to reflect more introspectively on how life experiences have shaped each of us. In a country like Canada that takes pride in accepting all individuals regardless of colour, culture, preference or spiritual belief, the question of exclusion remains an important one. Indeed, the most poignant discussions were centered around belonging and how each person at one time or another felt excluded in certain social spaces. Spaces where people felt inclusion brought about feelings of happiness and familiarity, and a connection to family and social groups. On the other hand, there were many stories of exclusion, whether from the beauty industry, academia, small towns, workplaces, or retail stores. However, with the African resilience and spirit of innovation, participants have been able to create their own spaces, and sometimes forge a way into spaces that are generally not welcoming. A feeling of African pride resonated across the room, a feeling that we bring a rich heritage and valuable experiences to Canada. At the same time, there was much discussion and reflection on how Canada has made instrumental changes in each of us. The deep connection to both Southern Africa and Canada reverberated as facilitators and participants recalled the length of time spent away from and in both regions. From pondering the meaning of each person’s name to sharing the strong African values related to family that cannot be forgotten, it was enlightening for us to see how both Southern African and Canadian identities have become an intertwined sense of being where customs, values, and sense of community-mindedness from both cultures weave their way into individuals’ daily practices. When asked on how Vancouver has (re)shaped identities, participants admitted to being lost at times but then learning to embrace themselves, and encountering a renewed appreciation for their home culture. Living in Canada helped many “sharpen their identities” as one participant reflected on the integration of their culture, Canada and now their husband’s culture. Race was brought up on several occasions. For participants who identified as being mixed, it was important for Africa to be viewed as a diverse place without a homogeneous population. Passionate voices were raised when we discussed experiences of being “othered” and “exoticized”, stereotyped and mistrusted. Frustration at not being able to find the applicable make-up shade in the store, for example, and of having to answer questions about animals and poverty in Africa were also commonplace. When discussing the Southern African diaspora, some commented about the importance of continuing to be connected to home despite the distance. Others either did not know or were unable to relate to the word ‘diaspora.” For some, “diaspora” did not hold any weight in how they defined themselves despite still feeling a connection to Southern Africa. For one participant, diaspora meant being able to connect easily with people from the community, to share culture and tradition, foods and stories, and to not have to explain oneself. All in all, we felt refreshed and invigorated by this dialogue. We were humbled by how much people had to share and believe that everyone went away with a renewed feeling of what it means to be African and Canadian, to come from a place with a rich, often unacknowledged heritage. This initiative has been a labour of love but having the opportunity to self-reflect and share experiences with each other was priceless. We wanted new voices and experiences to be heard, to compare and contrast experiences, and to reach a deeper understanding of pertinent issues. What we got were rich stories, a lot of laughter, bonding, and reminiscences. Yet, despite all of this, we barely scratched the surface.This often overlooked group has a lot to offer, if only more of our voices were heard. This session clearly demonstrated that more dialogue is needed. Now the question we need to ask ourselves is: where do we go from here and how can we further this dialogue? How can we let more people feel welcomed and ultimately, how can we use our skills and experiences to enrich the multicultural tapestry in Canada? I would greatly appreciate you checking out my site, perhaps you could even vote on the poll and leave a comment about your thoughts on identity on the musings and reflections page? I will report my findings after the July 2, 2014 event. A few weeks ago I attended Margaret Macmillan’s talk at the Vancouver Public Library. I came across Macmillan because my professor recommended her book, The War That Ended Peace , to the class. It hadn’t hit me that this is the centennial year of the start of WW1 so it is apt that Macmillan’s book is becoming more talked about now. It was really a novel experience to be around people who liked history as much as I did although I was disappointed that there were very few people in my age group there. It was an even better experience to listen to someone speak who has a connection to history herself ( Macmillan is the great granddaughter of David Lloyd George, Prime Minister of the United Kingdom for the first couple of years of WW1). I found the event absolutely engaging. If I’d taken any History courses during my undergrad, I’d have loved to have had a professor like Macmillan. It’s so clear when someone is passionate about their work as she is. Macmillan said she loves “moments in history where issues become clear even when they are not settled.” She gave a lot of food for thought. I found it interesting that Macmillan said there were a lot of parallels between the time pre-1914 and our present time, namely, we have become used to peace like our forebears did. She also made very interesting observations about Europe in those days. Europeans were overly-confident about their progress and about how powerful their continent was. They believed any war that would take place would be short-lived. They also believed that it was only a matter of time before China and the Ottoman Empire were divided up among them. They believed in the evolution of the human race and that Europeans were too civilized and advanced to go to war. Macmillan referenced the 1909 book entitled “The Great Illusion” where the author believed that war was unlikely as it profited nobody. Interesting fact: When WW1 broke out, 30,000 works in England were published to discuss the cause of the war, whose fault it was. It was more than just the assassination of Franz Ferdinand. This is of course worrying because if we’re not sure of the cause how are we going to deal with similar situations today? In history there are a lot of “what if’s”: What if there had been no WW1? Would there have been a Russian Revolution, and by extension, a Stalin, communism, or a Cold War? If the Ottoman Empire had still been intact, how would the Middle East have turned out? Is it possible that the British and French empires would still be in existence today, and that the USA would not have been as powerful as it is today if WW1 hadn’t broken out? Was WW1 inevitable? Macmillan doesn’t think so. She believes that a couple of main factors were the reason. Globalization was one; this made people more suspicious of each other as they became intimately linked, Germany and Great Britain in particular. There was an 1896 pamphlet entitled “Made in Germany” that contained protectionism against Germany, who was seen as a threat economically. The second reason was the growth in nationalism as the public became more literate and informed. Mythical histories formed, the popularity of social Darwinism which helped propagate the idea that struggle is good was also an issue, and the fact that military was seen as noble was not to be questioned all lent a hand here. During the very short Q&A section, the first question from the audience, and I could see this one coming, was to ask Macmillan her thoughts on the crisis in the Ukraine. What I’d like to say here is that I’ve heard a lot of people question the value of humanities degrees (and I have one so this is speaking from experience), yet at this time where Russia and the Ukraine are making the news, people see the need of turning to a public intellectual, a humanities scholar (historian), for assurance and clarity. In response to the question about the Ukraine, Macmillan stated that it all depends on Putin, which makes sense. The Ukraine can’t respond with force but the crisis has the potential to bring in other powers. Another interesting question was about social media. Macmillan stated that although it’s good that we get messages a lot quicker, it does put a lot of pressure on the government to make quick decisions in times when they really should be taking their time to think things carefully. Slightly off-topic, I met a very interesting lady at the event. She writes lyrics for The Raging Grannies. She talked to me about her life, how she stopped working as a fashion designer to do activism work. I’m not sure how old she is, only that she shares a birthday with Nelson Mandela, but the fact that she’s still going strong, writing, and going to protests really inspired me. Be a poke…or several pokes! Be a satire! Be your age! It’s up to us to rage! From which a new world will arise! It’s never easy when my opinion is contrary to everyone else’s. It makes me wonder whether I’m being over-sensitive or over-reacting but I figure if I have a persistent feeling about something I should address it, after all my opinion matters. This is about entertainment and the critiquing of it. I’m not talking about needlessly criticizing of course, but being able to notice when something seems off. With that little disclaimer, I will continue. At this point I’m sure some people are saying, “Rowena, not again with the race talks. What’s wrong with African acrobats performing?” Well, that’s definitely not the issue. As homesick as I get sometimes, seeing African culture really makes me happy. The acrobats were great, had lots of energy and actually kept me alert after the slower parts of the show. My problem was with trying to understand why they were included in the show in the first place. Firstly, the acrobats had absolutely no interaction with the horses, which made me wonder: where they there as an afterthought? They just seemed so anachronistic. I racked my brain trying to figure out a connection between Middle Earth and the African savannah and I could find none. Not that I’m a purist when it comes to entertainment; I can definitely see the appeal of fusing different styles of things together. The oddest mixes often work. Thinking back on my experiences eating Jamaican-inspired pasta dishes in the Bahamas, or listening to the Celtic and Indian Vancouver fusion band, Delhi 2 Dublin, reminds me of that. However, the acrobats in this show did not fit in. If I were to be really critical I would say this is an instance of selling (exploiting?) culture. I just felt that this was a dichotomy of the savage and the civilized, one that I’ve seen again and again. Perhaps people miss it because it’s so commonplace but it sticks out like a sore thumb to me and I’m getting so tired of it. People often say “It’s just entertainment.” Well, how can it “just be” entertainment? No matter how innocent something appears to be the imagery and symbolism impact us. As I’ve heard said countless times, everything is symbolic. You can’t deny the symbols, what they mean and what they have been taken to mean outside of their original context. People already know how I feel about stereotypes and representation/misrepresentation. Weirdly juxtaposing African entertainment in such a setting speaks volumes to me. How blacks, Africans in particular, are portrayed in popular entertainment is probably one of the reasons that when I’m in a group, people expect me to entertain them (and I honestly wish I was joking); after all I’m the one who is supposed to have “soul” and “sass” (both terms people have used to describe me and other black people). Well, the media and other entertainment definitely perpetuates this. The “exotic” sells, does it not? I for one am quite fed up with the way Africans are portrayed, so uni-dimensionally. It definitely comes of as tokenism, something I hope to address in a future post. For Black History Month, the Vancouver Public Library hosted a Black poetry event. I was excited to go because I love poetry and have only ever read poetry from one Canadian poet, Dionne Brand. I was sure Canada had more to offer in terms of poetry, and this was the perfect event to find out more. What I didn’t know about this event, and what I was pleasantly surprised to find out, was that it was actually a book launch for Canada’s FIRST black poem anthology, entitled The Great Black North, edited by Kevan Anthony Cameron and Valerie Mason-John, who also served as the MC’s for the event.We listened to roughly eight local black poets recite one of their poems. I found the whole event fascinating. The poets all had compelling things to say. One thing that was thought-provoking was the question raised about identity. Are we simply Canadian, or are we Black, or African-Canadian? What does it all mean? The poets represented many backgrounds, such as England, Belize, Jamaica and Uganda, so I thought that was an interesting question to ask. It turns out that in the world of poetry, there is elitism. Slam poetry is seen as easier as and less elegant than print poetry, probably because it has been likened to “rap battles.” The rumours about that were dispelled by Vancouver’s reigning poetry slam champion, Jillian Christmas. One question from the audience was pertaining to the role of race in the poems; how big a role does race play in their poetry? One poet, who acknowledged his militant reputation, said that when he talks to a group of young kids who want to know that he understands their struggles as black teens in Canada, he is as transparent as possible and doesn’t hold back. Others said that regardless of the fact that they try not to base their poems on race, race is a big part of their life and something that needs to be brought out into the open. They also talked about how poetry can heal and make people realize that they are not alone. Another poet talked about how people expected her to discuss certain topics when it comes to her live poetry performances, because of her appearance, and how she always tries to surprise them, but she also finds it therapeutic to express her frustrations about how she is treated as a black woman, through her poetry. All in all, a wonderful event. I came to appreciate that poetry has more power and reach than I had ever realized. I had the honour of attending Junot Diaz’s author talk at Vancouver’s annual International Writer’s Festival. He was reading excerpts from the first three of the short stories in his latest book, This is How you Lose Her, (The Sun, The Moon, The Stars; Nilda and Alma). I was honestly struck by how emphatically he read his own stories, even more impressed that I remembered his cadences weeks later when I actually sat down to read his book. He is a gifted orator, as well as a storyteller. As mentioned, this is a collection of short stories. They all feature a young Dominican-American man named Yunior, the narrative persona Diaz uses in most of his work. The main motif of the stories is cheating. Other themes include immigration keeping families apart, patriarchy, racism and colourism. Why I love this book is that Diaz incorporates so many different style of language in it. In the same paragraph he may use “street-slang”, Spanish expressions, as well as erudite expressions. The way he organizes it is witty and very timely; I burst out laughing more than once while reading the stories. 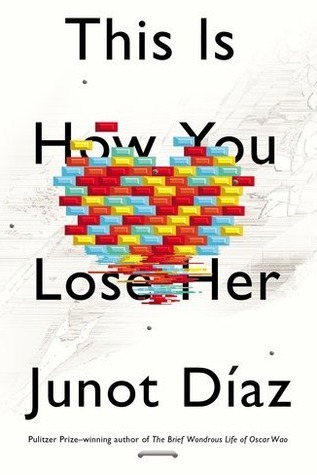 Why I admire Diaz so much as an author is his need to challenge simplistic knowledge in his books. He says he’s obsessed (his word choice) with patriarchy and by how masculinity interacts in society. His stories also contain colourism issues and during his talk he talked about the prevalence of skin bleaching, what he believed was a result of the power of eurocentrism and was something we despise talking about. In his own words, it’s more hidden that Sauron and Voldermot! I was able to get my copy of his book, Drown, signed.